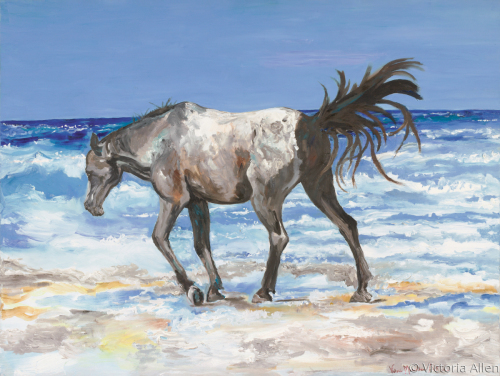 This oil on gallery wrapped canvas painting captures a special moment of a solitary horse wandering the beach on Padre Island in South Texas. Although the morning skies were clear the wind was blowing and the surf was rolling pretty good. I watched the horse for nearly an hour as it wandered along the sandy shore with just its hooves in the water. Eventually the horse wandered back into the sand dunes and vegetation where it disappeared from view. 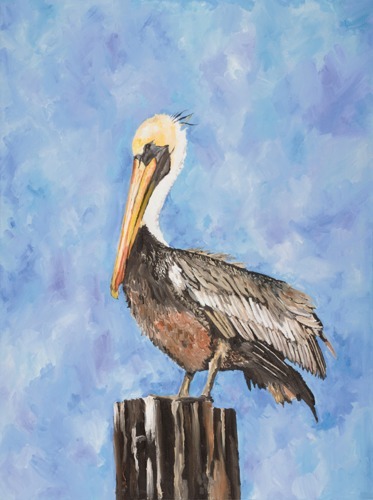 Although the original of this painting is owned by a private collector prints are available. 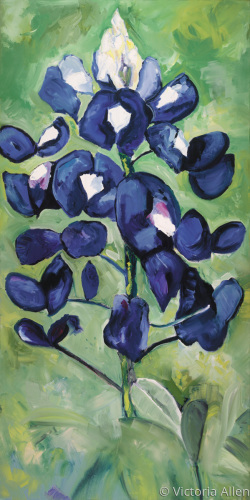 This 24"x48" oil on gallery wrapped canvas is an oversized interpretation of the Texas Bluebonnet. Painted in a contemporary realism style the colors are bold and dynamic. With storm clouds on the horizon the fisherman had already returned to the beach at Crash Boat Beach in Aquadilla, Puerto Rico. 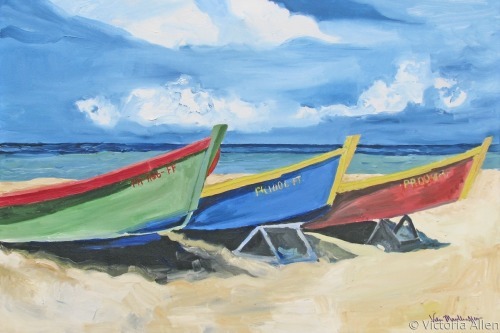 This 30" x 40" oil painting captures some of the colorful fishing boats that had been brought ashore and placed on their supports. 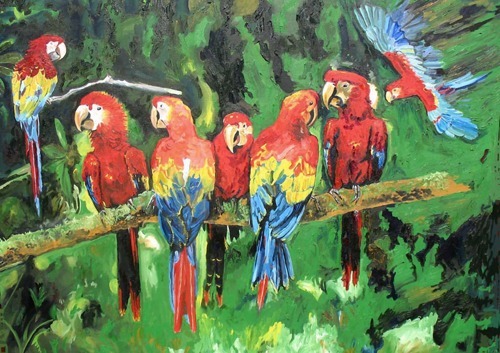 6" x 9"7" x 10.5"8" x 12"9" x 13.5"11.75" x 17.75"
This 30 x 40 oil painting captures the beauty of wild Macaws along a river in Costa Rica. The painting comes framed. 5" x 7"6" x 8.5"7" x 10"8" x 11.25"9" x 12.75"11.25" x 16"
We are truly fortunate to have several colonies of breeding Roseate Spoonbills here on the coast in South Texas. Breeding season heightens the pink coloring of the spoonbills. 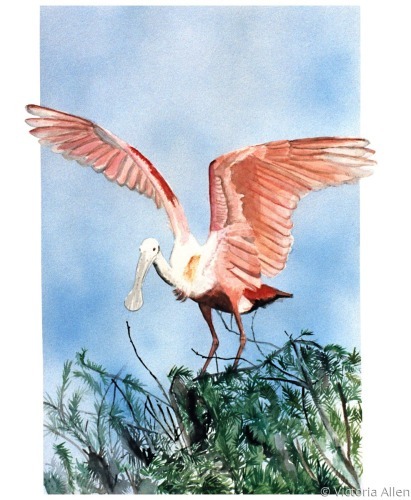 This 22x30 watercolor captures a Spoonbill at the beginning of the nesting season. 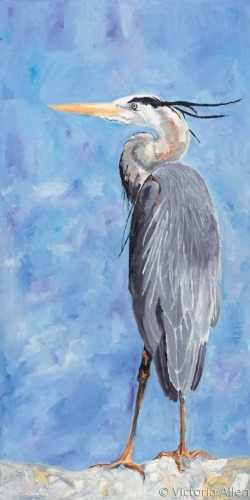 9.75" x 8"17" x 14"24" x 19.75"
This 24x48 oil on canvas captures this wonderful Great Blue Heron waiting patiently for it's next meal to swim by. Although fairly common, the Great Blue Heron is always a magnificent bird to find as they allow you approach fairly close in order to capture details for the painting. 14" x 7"22" x 11"35" x 17.5"